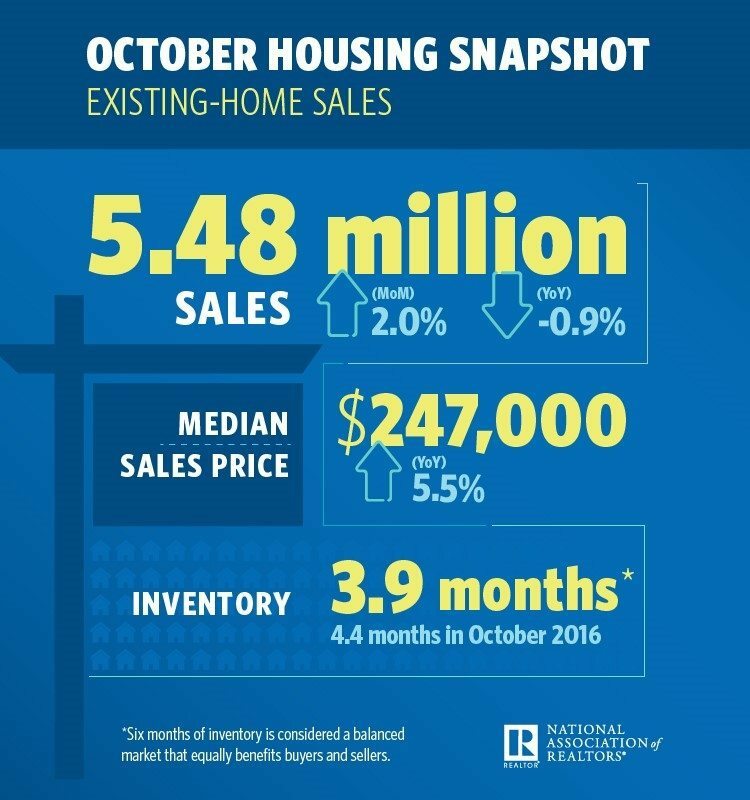 The National Association of Realtors’ (NAR) existing-home sales increased 2.0 percent to a seasonally adjusted annual rate (SAAR) of 5.48 million in October — up from a downwardly revised 5.37 million in September. This month’s sales pace is 0.9 percent below October 2016 but is the strongest sales pace since this June (5.51 million). The median existing-home price for all housing types in October rose 5.5 percent to $247,000, making October the 68th month in a row to see year-over-year gains. Total housing inventory fell 3.2 percent points month-over-month to 1.80 million homes for sale, while year-over-year inventory dropped 10.4 percentage points, its 29th consecutive month of year-over-year declines. Unsold inventory is at a 3.9-month supply, a 4.4 percent year-over-year decline. NAR Chief Economist Lawrence Yun says strong jobs growth and increases in wages are what’s propelling buyers to stay in the market and attempt to work around limited amounts of inventory. “Job growth in most of the country continues to carry on at a robust level and is starting to slowly push up wages, which is in turn giving households added assurance that now is a good time to buy a home,” he said, adding that low inventory was keeping sales low. Single-family home sales were at a SAAR of 4.87 million — a 0.10 percentage point month-over-month increase and a 1.0 percentage point year-over-year decrease. The sales price for single-family homes increased by 5.4 percentage points to $248,300. Existing condominium and co-op sales increased 1.7 percentage points to a SAAR of 610,000 units, unchanged from a year ago. The median existing condo price in September was $236,800 — up 6.9 percentage points from 2016. “In the Northeast, sales rose 4.2 percent to an annual rate of 740,000, (unchanged from a year ago). The median price in the Northeast was $272,800, which is 6.6 percent above October 2016.